This is a cute story of a young witch undertaking her independence by taking up the role of an air courier. This is a rite of passage for any young witch at the age of thirteen; to fulfil a year of living by themselves to complete their course of study. As usual Studio Ghibli has filled their story with a bevy of brilliant characters that really come to life in their own right. 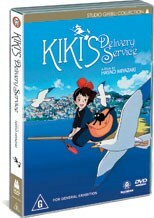 Through superb animation and storytelling Kiki and her cheeky cat Jiji make their way through the story that will have you entranced, quite rightfully earning Hayao Miyazaki, master animator, the title of the Walt Disney of Japan. The tale is a gentle one that allows us to see Kiki become more sure of herself and develop into a young woman with the help of the folk that she lives and works with. The pace moves at just the right rate to avoid being boring and you are keen to see what becomes of the little witch. The video itself is quite good quality and the audio and score fit the mood of the feature perfectly. The extras are a little light on with storyboards (which do run for the entire feature and well worth the watch) and the original Japanese trailers. I’m not sure that this movie will be good for all fans of Ghibli titles. I thoroughly enjoyed it, however I can appreciate a heavily character driven plot. For those of you expecting something along the lines of Spirited Away or Howl’s Moving Castle, you are simply not going to get that. I’m going to recommend this one and simply suggest that if you are not sure about a title that is not action packed, then maybe you should give it a rent first.